If your children are anything like mine, they’re asking to bring out the Halloween bins in August and the Christmas decorations in October. Though our children’s enthusiasm can be contagious, not everyone enjoys decorating or wants to make it a priority in their busy lives. Between the holiday concerts, cookie exchanges, Christmas caroling, tacky light tour, grand illumination, family portraits, and gift shopping, holiday decorating is often the last thing on your mind. However, children often enjoy marking the changes of the seasons, and these memories will stay with them for years to come. You can have a wonderfully festive holiday home without going overboard. 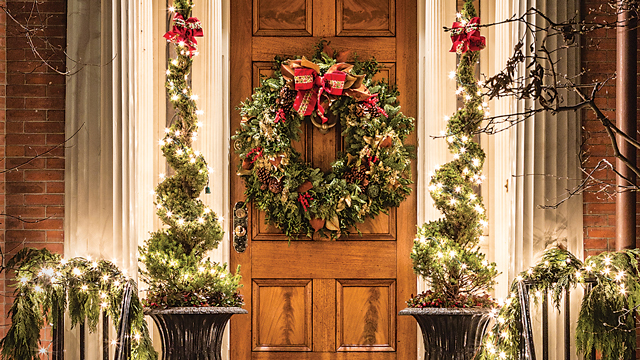 Here are some simple steps to help prepare your home for the holidays. 1. Start with the front door. Neutral colors are easily accented with bright colors, and the current gray trend in home decor works well with holiday shades. Some well-suited color combos I recommend are blue and silver, green and red, gray and red, and any combination of metallics. Since the color green is prevalent in my home and we celebrate Christmas, red is a natural accompaniment. Don’t be afraid to try something new each year. Holiday throw pillows and textiles are an easy way to introduce new colors to your existing palette. The holidays bring people together, and one way to be party-ready at all times is to set up your home for easy entertaining. Arranging a centerpiece on your table at the beginning of the season will carry you through the holidays. It can be as simple as some gourds and a cornucopia for Thanksgiving or some hurricanes filled with chestnuts and some votives. For a more elaborate centerpiece, try incorporating fresh greenery, colorful ribbon, and candles at varying heights for winter holidays. For the next few months, festive linens, napkins, and table runners (instead of tablecloths) can also help your holiday table stand out from other times of the year. 4. How about the holiday mantle? An easy and beautiful way to bring natural elements indoors is to incorporate fresh greenery into your mantle. For an update on a classic look, fresh evergreen swags can be accented with large ribbon and small LED lighting. Adding two large poinsettias to either side of the mantle will help make it a focal point of your home. One of the most unique ways to decorate is to incorporate any family heirlooms you may possess. This brings a personal touch to your décor and is most often what guests will notice first when visiting your home. You might tie holiday ribbons on your grandmother’s champagne flutes, display your family menorah in a proud place, or showcase the hand-embroidered napkins your great aunt lovingly passed down to you. The mix of old and new should be embraced and celebrated throughout your home. However you decide to decorate for the season, keep in mind that the ultimate goal of holiday decorating is to create an inviting and comfortable space for you, your family, and friends. Here’s to a lovely holiday season! Leah launched her company, Leah Walder Interiors, to help families make the most of their spaces. She lives in Westover Hills with her husband, Michael, and their two young daughters.